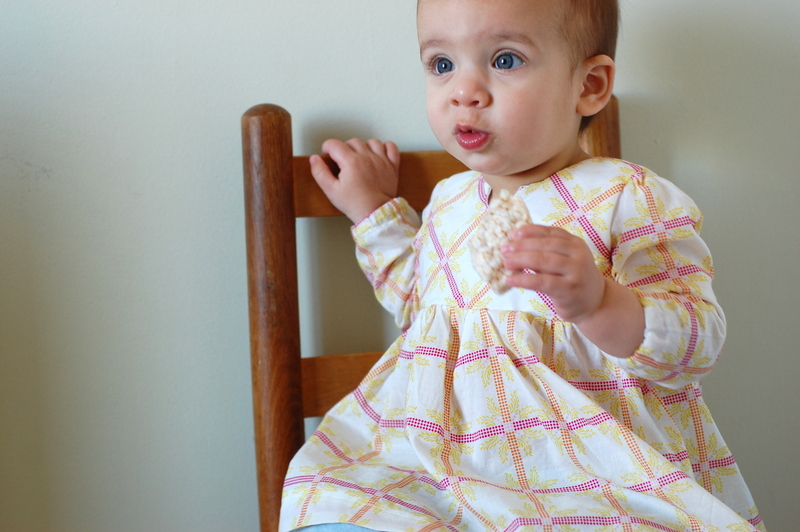 I sewed up a Geranium tunic for Corinne last week and finally cut into some much-loved AMH little folks voile. I love how my last Geranium turned out for Ellery, and I love how different this one is. This fabric is so nice and light, i thought it would make a nice breezy top. I’m happy that she can wear this now right on into the Springtime. So, I added long sleeves here – not an option in the pattern, but I figured it would just look super cute and couldn’t be too hard. For the sleeves, I used a pattern piece that I already had handy- from the baby in the hood jacket (from this book) that I made a couple of years ago for Grant. I added an elastic casing at the cuffs. I did trim my sleeve pattern piece down a little bit along the sides, but I wish I had left it as wide it was- I think this shirt would be perfection if the sleeves were just a teensy bit roomier. But, it’s totally wearable, and I’m loving it on her, so no biggie. Next time, next time…. Here’s “Coco” (as she is affectionately known around here) and her bribery snack of choice: baby Mum Mum crackers. Anyway, to attach the sleeves, I didn’t really have a plan of attack since I’ve never sewn sleeves to a lined bodice. But, I remembered Rae’s tutorial and video for adding sleeves to a Washi dress, so I followed that… I’m sure there are other ways to add sleeves to a lined bodice, but the girl knows what she’s talking about, so I let her guide me through it. And it went very well… even though it looks all kinds of crazy when you’re sewing it up! No really… check out that video to see what I mean. That’s what I love about sewing- sometimes you just have to trust the instructions in front of you and forego your own thought processes. I always learn something. Always. I made the 12-18 month size for my almost 11 month old! 11 months already?? what?? Instead of using 3 buttons as the pattern suggests, I decided to use 2 here just because I liked how it looked. I’m really digging this pattern and have seen so many great variations in the flickr pool. Corinne has been walking since just after her 9 month birthday, and I really feel like she’s in the mix with the other *big* kids because of that.. but it’s funny because she still looks like such a baby to me… I took her to an open-gym today with tons of other kids and she had no problem leaving my side to cruise around after balls, crawl through tunnels, and at one point even walking up to some random boy on a bike and planting the biggest slobbery open-mouthed kiss on his face. I just adore this dress! 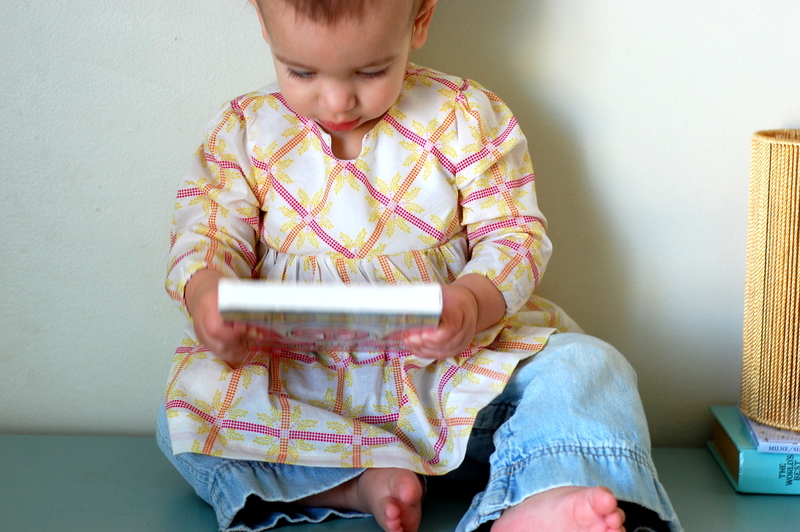 The material, the pattern,THE BABY, are all beautiful. Can’t wait to babysit little Coco-bean tonight! 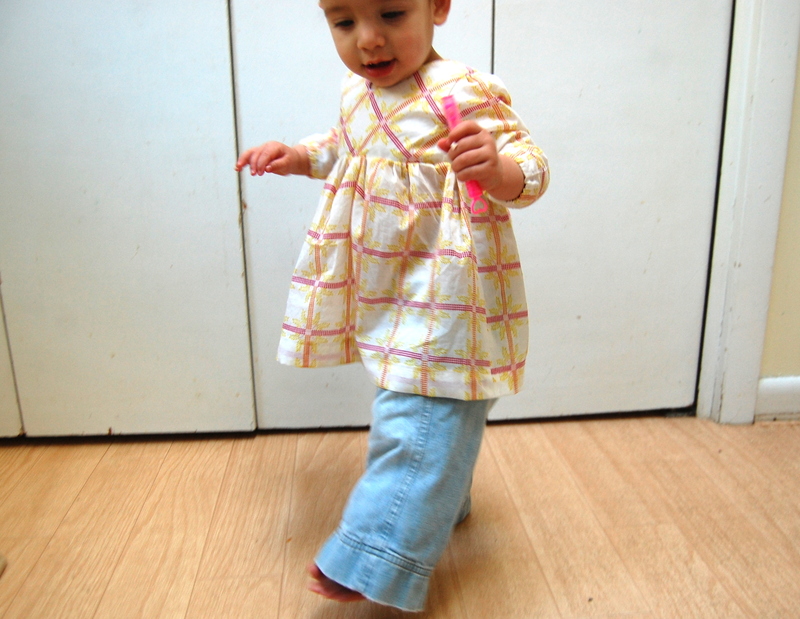 She is so cute – those early walkers are so funny, they seem too tiny to be upright! I’ll bet this is so wonderful to the touch in voile. This is just perfect, the voile, the print, the pattern, love it all!! GAH! Love it. SO adorbs. And so cool that you figured out the sleeve thing — one of the first ever “geraniums” for Clementine had sleeves (this one: http://www.made-by-rae.com/2011/03/daisy-queen-strikes-again/) but it seemed a little too ambitious to add to the pattern for beginners. Love it with the sleeves!!! very, very sweet. i love the sleeves! 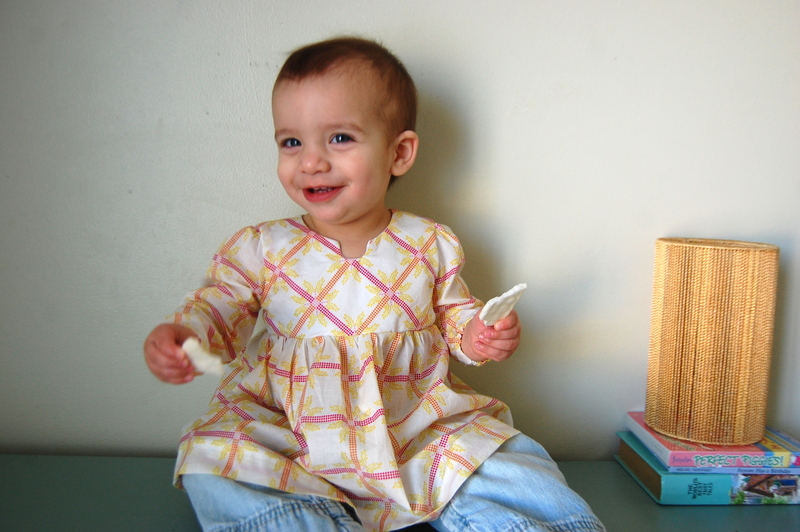 and silky voile – what a lucky girl! Love the long sleeves on the Geranium and how adorable is CoCo (which, by the way, is what I wish I was called)!? So lovely, Erin! So precious. Speaking of directions I have ahard time following them myself. I think of thema s suggestions. 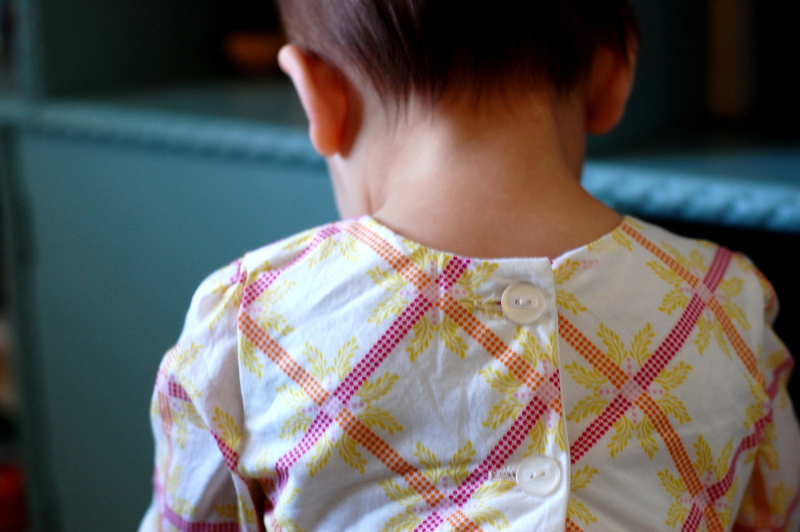 Featuring your cute baby at Sew & Tell. This outfit is adorable,as is the sweet model wearing it. Omgoodness. Such a cute dress! It’s like a mini version of the Washi dress. Love the addition of sleeves! I was on the fence about purchasing the pattern but your version may have decided things. Hi! This is adorable! I’d like to add long-sleeves to the Geranium dress, too. Did you use the sleeveless option for the bodice, or did you have to modify the bodice at all?